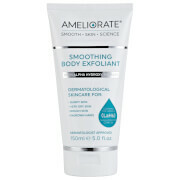 Achieve intense nourishment with the Transforming Body Cream from AMELIORATE, a brand specialising in skincare for those experiencing Keratosis Pilaris, or dry, bumpy ‘chicken skin’. The rich and emollient moisturiser uses the exfoliating powers of Lactic Acid to sweep away dead cells, resurfacing the skin and promoting renewal and repair. At the same time, a potent blend of Squalane, Camelina Oil and Shea and Cocoa Butters works to lock in hydration for up to 12 hours, strengthening the natural moisture barrier and improving elasticity. Apply twice daily for 4 weeks. Thereafter apply daily to maintain skin’s optimum condition. Aqua/Water/Eau, Ammonium Lactate*, Octyldodecanol, Cetearyl Alcohol, C12-15 Alkyl Benzoate, Squalane, Theobroma Cacao (Cocoa) Seed Butter, Butyrospermum Parkii (Shea) Butter, Glyceryl Stearate, Cetyl Alcohol, Camelina Sativa (Gold of Pleasure) Seed Oil, PEG-75 Stearate, Fragrance (Parfum), Sodium Benzoate, Xanthan Gum, Ceteth-20, Steareth-20, Glycerin, PEG-100 Stearate, Disodium EDTA, Potassium Sorbate, Pentylene Glycol, Hydrolyzed Milk Protein, Lactic Acid, Serine, Sodium Lactate, Sorbitol, Urea, Linalool, Citronellol, Citrus Aurantium Dulcis (Orange) Oil, Limonene, Coumarin, Juniperus Mexicana (Cedarwood) Oil, Alpha-Isomethyl Ionone, Sodium Chloride, Pelargonium Graveolens (Geranium) Oil, Geraniol, Allantoin, Sodium Hydroxide, Tocopherol. *From Lactic Acid.